Nic Stuart: The Russians are going! Every now and then - well, regularly, actually - a story comes along that makes me wonder about journalism. 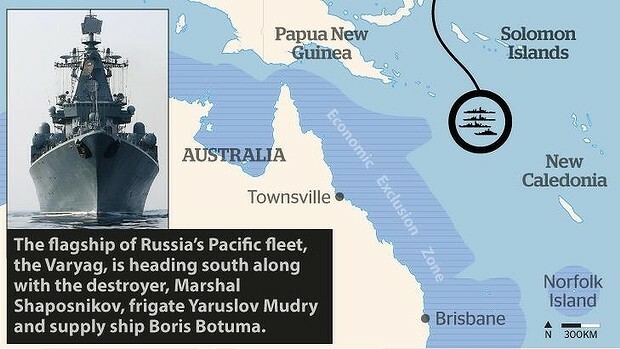 Last week's surprise was the reports of a Russian 'fleet' off the coast of northern Australia. The ships arrival was greeted with shock and awe. Personally I preferred the cartoon adds embedded in this desperate attempt at whipping up a story out of nothing. But guess what? Today they've gone home. So what did it all mean? What was it all about? I suspect the answers to those two questions are "nothing" and "not much" respectively. Although you can swap the answers around if you prefer. Another link to the non-story. Now even the press realise it was always rubbish. Nicholas...every now and then you wonder about journalism ? Healthy scepticism would mean you should wonder most of the time about journalism particularly if it originates from some of the 'interesting' mastheads of News Corp. This was a non story and who cares if some of Russia's fleet go sailing around in international waters. The amount of American airfleet hardware for Obama for the G20 meeting was far more than for Putin. Yes, I should have contrasted it to the US hardware. What troubled me was the way everyone else got on board to write about the yarn . . .
NO VISION . . . Does the Bishop speak Ex Cathedra? Is the US still Number One?